lĭ fà shī: xiān shēng, nín yào lĭ fà ma? barber: Do you want your hair cut, sir? lĭ fà shī: nín lĭ shén me yàng de? barber: How do you want? mài kè: zhào yuán yàng lĭ jiù xíng. Mike: Just the same as usual. lĭ fà shī: nín guā liăn ma? barber: Do you want your face shaved? mài kè: yào guā liăn, zài xiū yí xià hú zi. Mike: Yes, and I’d like my moustache trimmed. lĭ fà shī: qĭng nín dào zhè biān xĭ tóu.. chuī fēng shí shĭ yóu ma? barber: Please come here to have your hair washed. Do you like some pomade while drying? mài kè: shăo lái yī diănr. lĭ fà shī: hăo le. nín kàn kĕ yĭ ma? barber: How do you like it now? Barbershops have been opened in most guesthouses and big hotels. 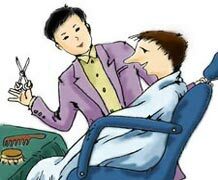 Guests may make an appointment to see a barber or go to the barber’s to have a hair cut directly. On the other hand, one can have a hair cut by choosing from the barbershops along the streets. They are of variable quality and skills, so prices differ too.